Outgoing governor Scott Walker recently issued a flurry of tweets under the headline “OUR LEGACY.” One key point, “More people are employed in Wisconsin this year than at any other time in the history of our state,” aims to buttress Walker’s claim that his reign has been good for the state economy. 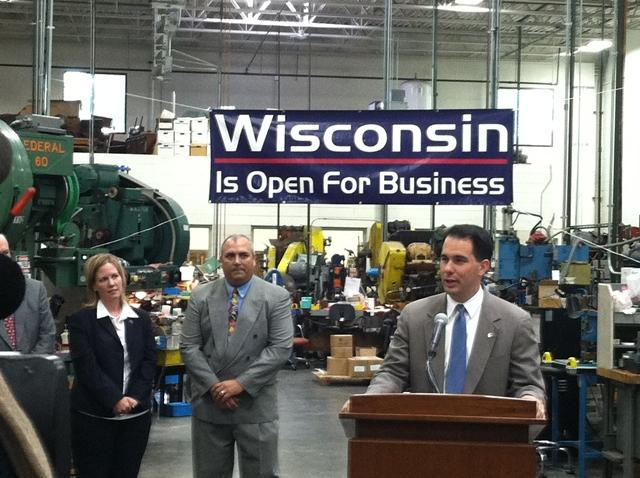 Which makes it an appropriate time to assess Walker’s total impact on jobs. There is no question Walker’s claim is true; the bigger question is how much of Wisconsin’s job growth is due to his policies and how much came despite them. When first running for governor, Walker promised his policies would produce 250,000 Wisconsin jobs in four years. It has taken eight years, but this goal might finally be within reach. As of October, Wisconsin has added 238,000 since Walker entered office. One can argue that his promise was never realistic. The unfortunate message to other candidates, however, may be that over-optimistic promises win elections. ‏How can we disentangle the effect of Walker’s policies from the effect of national and global trends? One approach is to compare Wisconsin’s record with those of states with similar economies. The next graph shows the number of non-farm jobs in the 6 Midwestern states that border the Great Lakes, since 1990. Over these three decades, jobs in these states follow notably similar patterns, with steady growth in the 90s, a moderate downturn at the start the new millennium, a very sharp decline in the Great Recession, and steady job growth since then. Of the six states, Michigan differs the most, presumably reflecting turmoil in the auto business. Michigan is also the only state whose governor cannot brag, along with Walker, that more people are employed than ever before. 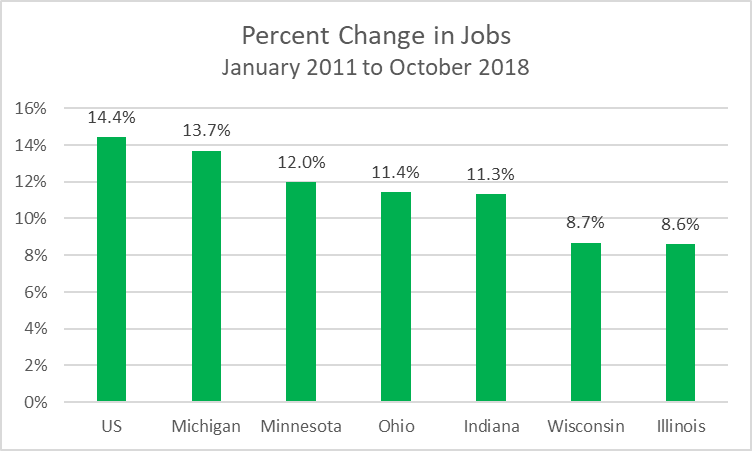 The next chart shows the percentage growth in jobs in these six states (as well as the nation as a whole) during Walker’s almost eight years in office. Compared to its neighboring states, Wisconsin’s job performance has been lackluster during this period. In fact, it has been jousting with Illinois for the honor of bringing up the rear. And it should be remembered that Illinois has been hurt by its inability to solve its way-underfunded public pension system. All the Great Lakes states underperformed the nation as a whole. Jobs in states like California, with 20 percent job growth in the same, pulled up the national average. This raises the question as to whether Wisconsin’s lackluster job performance during the Walker years was due to something inherent in Wisconsin, rather than anything that Walker did. 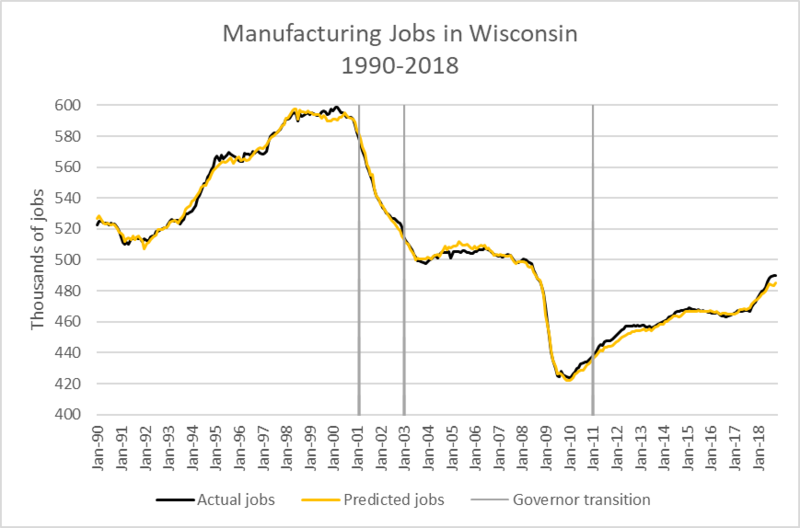 To explore this question, I first developed a regression model to predict Wisconsin jobs in the 22-year period prior to Walker’s start as governor. Economically and politically, this was a very diverse period, with parts of three recessions and their recoveries. Three governors served the state, two Republicans—Tommy Thompson and Scott McCallum—and one Democrat—Jim Doyle. 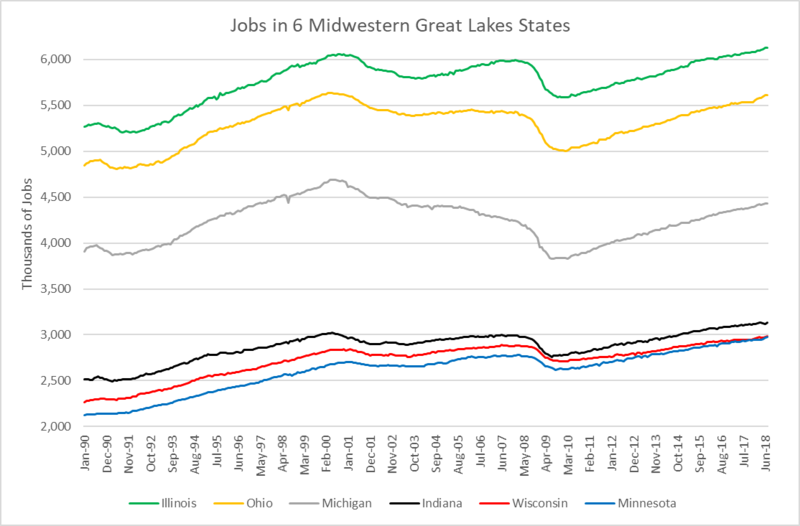 Yet the resulting equation, based solely on jobs in the other five Great Lakes states closely tracks Wisconsin jobs during the pre-Walker period. 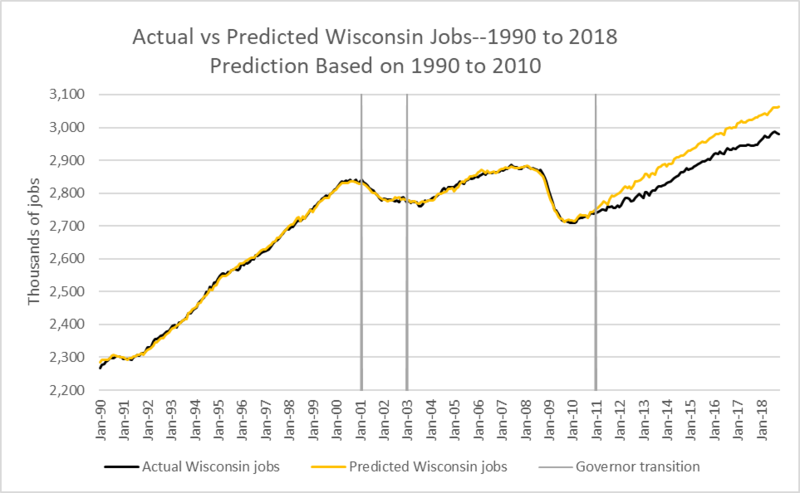 The next graph compares Wisconsin’s actual job performance (black line) with that predicted by the model (in yellow). Between 1990 and 2010, the two lines cohere closely. Once Walker takes over, however, they diverge. Following Walker’s inauguration, the model becomes increasingly over optimistic. In fact, for October, the most recent month for which data are available, it predicts 85,000 more Wisconsin jobs than exist. Something happened upon Walker’s assumption of power that moved Wisconsin job growth to a lower trajectory. One expected panacea for Wisconsin’s job doldrums was the manufacturing and agricultural tax credit, which was phased in early in Walker’s term. The next chart shows the actual number of Wisconsin manufacturing jobs from 1990 to this October (shown as a black line). This can be compared to the predicted jobs, shown as a yellow line. The predicted jobs are based on the number of manufacturing jobs in the other Great Lakes states. If the tax credit had produced a noticeable number of jobs, one would expect the model to under-predict jobs as the credit kicked in. Instead, jobs grew almost exactly as the model predicted. The Walker administration represented the triumph of an ideology that promises to bring prosperity through low taxes — particularly on wealthy people and business firms — the elimination of regulations and keeping labor costs low. It is variously called “supply-side economics” or, more colloquially, a “business-friendly” environment. Evidence is mounting that supply-side does not work for most who try it. Kansas, with the most well-publicized effort towards prosperity through cutting government, ended up under funding schools and slashing public services, but with no sign of the boom in private investment. In desperation, the voters in that bright-red state elected a Democrat as governor last month. The failure of supply-side in Wisconsin is more muted. Partly the continued recovery from the Great Recession helped mask Wisconsin’s weak job growth. The subsidies to private firms like Foxconn and Kimberly-Clark are tacit admissions that supply-side does not work as promised. Rather than letting the “business-friendly” policies do their work, Wisconsin is reduced to bribing firms to stay or come to the state. There is increasing evidence that supply-side has it backwards. Rather than being drivers of economic development, firms that re-locate are the followers. As the recent decision of Amazon to build its second headquarters in Queens and suburban Washington or Apples’ choice of Austin show, location decisions are heavily influenced by firms’ judgments about whether they can find or attract employees. By diverting funds from things that will make an attractive place to live, supply-side economics hobbles a state or city in the competition to create the most desirable places to live. Your last part is the one that hits it. Businesses and talent locate in places that offer a high quality of life, and decent wages. Walker and WISGOP chose the exact opposite – deinvesting in schools, roads, and environmental protections, and giving tax break after tax break to corporate donors. You see the failure that followed. Now Evers has to dig us out of the hole created…right as the Trump Recession seems to be looming around the corner.